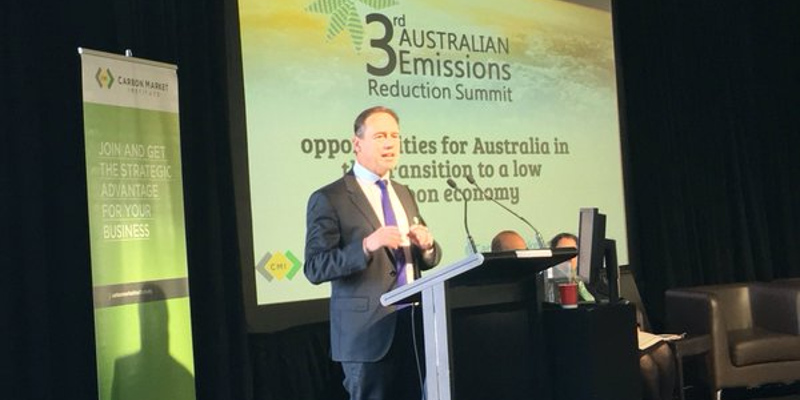 Results from the third Direct Action Emissions Reduction Fund (ERF) auction for emissions reduction was announced with 50.5 million worth of offsets at $10.23 each. So 67 per cent of the $2.55 billion budget has been spent to achieve less than 7 per cent of the emissions reduction goal by 2030. This effort amounts to less than 3 per cent of what is required for Australia's fair share in global emissions reduction for staying under the 2 degrees C limit as enshrined in the Paris Agreement. Environment Minister Greg Hunt signed the Paris agreement in New York on 22nd April 2016. Australia also agreed with aspiring to meet the 1.5 degrees target, so even more effort is required from Australian climate policy. But the Liberal National Party Government main policy instrument for reducing emissions is the Emissions Reduction Fund, which is clearly inadequate. Even our 2030 climate target of 26-28 per cent reduction by 2030 is ranked as inadequate. By comparison, Labor's target of 45 per cent emissions reduction by 2030, in their climate plan is a bare minimum for staying on a 2C decarbonisation pathway. Modelling by Warwick McKibbin for the government showed that the difference between the two targets amounted to 0.6 to 1 per cent of GDP: a relatively small amount. A recent opinion poll found that 57 per cent of Australian support Labor's 45 per cent emissions reduction target and introduction of an emissions trading scheme. "This is an outstanding result. The policy is not just working and reducing emissions, but we are hitting our targets and tackling climate change without Labor's electricity tax." "The overwhelming focus on the land sector discredits forever Labor's ridiculous claim that the ERF is all about “paying big polluters”. We are supporting practical projects that will significantly cut emissions and improve our environment. The Government has now contracted 143 million tonnes of emissions reduction through three ERF auctions at an average price of $12.10 per tonne of abatement. At best, Labor's carbon tax achieved around 12 million tonnes of emissions reduction. With $1.7 billion we have contracted emissions reduction totalling 143 million tonnes. Compare this with Labor's $5.5 billion payment to brown coal generators just to keep polluting with zero reduction in emissions. Only Labor pays the polluters to keep polluting. And unlike Labor, we're tackling climate change without putting jobs at risk and driving up electricity bills for households and businesses. #ERF spent 67% of $2.55bn budget for under 7% emission reduction task for govt's 2030 target & 3% of <2°C emission reduction task. Australia’s emissions are continuing to rise and the Emissions Reduction Fund is largely spent, showing once again that it could only ever function as a supporting part of a broader climate change policy framework, The Climate Institute said today. With no new funding budgeted for the Emissions Reduction Fund, Connor said carbon farming, and other emissions reduction jobs and industries reliant on it, are in the dark about their future - and the nation is still left waiting for the government to present a coherent plan to grow an economy with net zero emissions . Meanwhile Australia’s emissions have not actually fallen. In fact, after nearly a decade of gradual decline till 2014, the country’s domestic emissions are now rising and government projections are that they will keep doing so. By 2020, domestic emissions are projected to be 577 million tonnes annually, up by five per cent from current levels. The Climate Institute continues to underline the point that the longer we delay the implementation of a national policy to tackle the drivers of recent emissions increases, the more costly, disruptive and difficult it will be for Australia to prosper in a world shifting to clean energy and to deliver on our Paris commitments to help limit global average temperature rise to 1.5-2°C. Here is what Mark Speakman, the Liberal Party NSW Minister for Environment and Heritage, said about the auction: "NSW wins ERF auction + will plant 200,000 new trees in national parks". Land clearing is a big issue in Queensland and NSW. The Baird Government in NSW is repealing legislation on wildlife, biodiversity, land clearing. If these changes go through broad-scale land clearing may overwhelm what little impact the purchase of ERF offset credits in new trees will have. A recent story by Peter Hannam in the Sydney Morning Herald highlights the problem of land clearing in NSW: 'Bombshell': Just one-sixth of rural land-clearing tracked in NSW, ANU's Philip Gibbons says. "The proposed law and policy is a serious retrograde step, as it involves removing many of NSW’s long-held environmental protections. Our key areas of concern include greatly increased land clearing under self-assessable codes, no requirement to maintain or improve biodiversity, water quality, soil and salinity, an increased reliance on flexible (and indirect) offsets, wide discretion of consent authorities to apply the results of the Biodiversity Assessment Method (BAM), reduced public transparency, and unclear responsibility for who will actually do any compliance and enforcement. "The resourcing and expertise of Local Land Services to administer native vegetation regulation is also in question. Not only are legal protections significantly weakened, but any potential biodiversity gains are dependent on funding decisions and not guaranteed in legislation." “The Turnbull Government’s climate policy is completely illogical,” said Wilderness Society National Director Lyndon Schneiders. “It has done nothing as Queensland and now NSW have gutted nature laws and allowed millions of trees to be ripped up and burnt, and then spends $1.2 billion of taxpayers money to keep trees in the ground and plant new ones. It would be easier and far cheaper to just reduce tree clearing. “At the current rate of tree clearing, the entire 98.5 million tonnes of abatement from tree projects bought in the latest ERF auction will be wiped out in just under two years. “Australia’s greenhouse gas emissions from tree clearing are skyrocketing, with land-sector emissions almost doubling in the past three years while emissions from most other sectors are dropping. CO2 Australia predicts those emissions will now have reached 55 million tonnes a year. “Australia’s tree-clearing emissions were dropping until the Newman LNP Government gutted Queensland’s tree-clearing laws and unleashed the bulldozers. Queensland’s tree clearing has almost doubled in two years, from more than 150,000 hectares to in 2011-12 to almost 300,000ha in 2013-14, with emissions increasing from 22 million tonnes CO2e to 36Mt. “Just this week the Baird Government in NSW announced new laws that would allow a large increase in tree clearing, and Victoria, Western Australia, the Northern Territory and Tasmania have all weakened tree-clearing laws in recent years. “Bulldozers are ripping up our bushland, killing our native wildlife and are releasing millions of tonnes of greenhouse gases into the atmosphere. And the 2016 Federal Budget revealed no more money has been allocated to the $2.55 billion Emissions Reduction Fund (ERF). The Federal Government did not mention climate change and transition to a low carbon economy once in the Treasurer's budget speech.